12 ways to make the most of your holidays. Find a beautiful blank journal, or create one with handmade papers. Then write the year's blessings in it. This can be a private exercise or a family tradition. If you choose to make it a family activity, have each member write briefly and allow time to read past entries. Or, you may prefer a year-end journal to be completed after the holidays. Either way, it's sure to become a treasured keepsake. I never tire of seeing fine homes gleaming with colorful Christmas lights. The usual line of cars tells me I'm not the only one who enjoys the splendor! This year when you tour a glittery neighborhood, choose one decorated house and one undecorated house, say a prayer for the people who live there, and continue to pray for them every day thereafter until Christmas. Often the presents we shop so intently for are quickly forgotten. For a more memorable gift, why not try doing something? Think about what you might do for your spouse, friend, or parent that would have a longer-lasting, more positive impact on your relationship. Would your spouse appreciate a date night? Do your parents long for more quality time with you? Don't be afraid to ask—it doesn't have to be a surprise. Try your hand at a gingerbread church. You can work alone or with friends or family members. Pour some apple cider, start the Christmas music, and get to work. Choose a different country each year and create its most famous cathedral or simplest country church in miniature. Travel books can provide ideas. Then, pray for that nation throughout the month of December. Offer Jesus a symbolic gift in honor of his birthday. Give him an area of your life you desire to change—an emotion, an activity, or a relationship—and physically wrap a box to represent it. Do this individually or as a family. 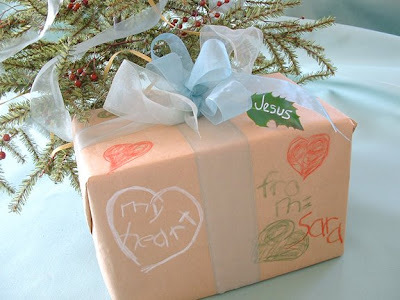 Create a family present to display every year by painting an unfinished wooden box and tying it with a silk ribbon. December is an extra busy month for church staffers who work extended hours due to holiday programs and an influx of visitors. Deliver a hot meal to one or more of these families to help lighten their load. Set aside an annual night to relish simple, old-fashioned joys. Pop some corn and snuggle with a book of sentimental short stories of Christmases past. If you have kids, plan a night of games and pizzas. Saunter through the snow-covered woods, leaving a trail of snow angels behind. Or, if you live in a warmer climate, grab a blanket, head outside, and search for the star in the East. Whatever you do, take reprieve from worries and reflect on Christ's humble birth. The end of a year is a wonderful opportunity to engage in earnest reflection. Take time to forgive anyone who's wronged you during the year and for whom you still harbor resentment or bitterness. Begin the new year with a refreshed heart! This is really lovely and hits home with me this year more than ever. My oldest brother was diagnosed with terminal cancer in October and given 2-9 months to live. This year Christmas is all about celebrating his life and making what may be his last holiday season as joyful as possible. This is a wonderful post! Lots of very good ideas! Really beautiful ideas Joan! Love them all (especially like the idea of praying for two houses- neat! I love all of these, but especially numbers 7 and 8. I'll try these next year. I blogged about the beautiful giveaway items I won. Hope you get many more people coming by here for your 'inspiring ideas'. Karen, Your brother is blessed to have you as his sister! I pray God makes this time precious and draws you all closer to Him. Kirstin - I hope to get to the bookmarks after the new year! Thanks for asking! 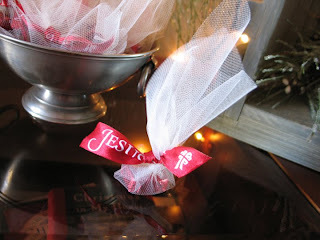 I love all of these ideas but #5 (arrange a party to package gift baskets) stands out as a something my small group of special friends could do together. Sending Merry Christmas wishes to you! I'm afraid I'm reading this a little late to implement very many of these ideas, but I've been thinking a lot about forgiveness lately; it's worth it. Thank you (as always) for the lovely ideas. These are very neat ideas! I especially like number 4 because we are married with no children and our parents have all died. It would be really nice to find another couple in our situation to buy for. I love buying gifts. No. 5--the gift basket idea is fun too! Our ladies at church have done this in the past for people in the church around Thanksgiving time who could use a lift. I love the idea of having a group of friends put together a gift basket for a pregnancy center! I am part of an awesome AP group, so pregnancy/birth is always on our hearts. I will suggest this for our next big gathering! really lovely...and I am going to take on the last idea of starting the new year right...forgiveness eve...what a wonderful idea. This is a lovely blog that you have. I'm glad I just stumbled upon it! Thank you for all of the wonderful ideas. Awwe, your list was completely lovely. Love your ideas. Will try as many as I can. Thank you. Love your ideas. Will try as many as I can. I'm Jeanne Winters, offering art and creative ideas to infuse your home, celebrations and life! with reflections of your faith. 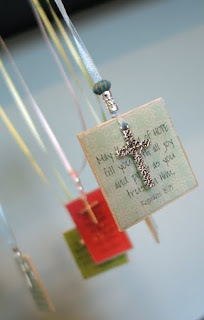 My book Inspirational Home: simple ideas for uplifting decor and craft includes more such ideas. ©2008-2012 Jeanne Winters. Powered by Blogger.